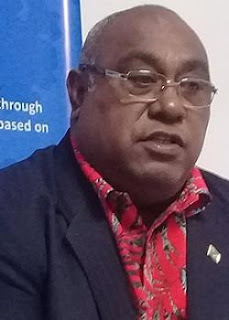 The vulnerable Pacific Island region and its communities are particularly threatened by illegal, unreported and unregulated fishing, a Fijian minister warned on Monday. Speaking at a symposium at the University of the South Pacific (USP), Fiji's Minister for Fisheries Semi Koroilavesau said that illegal, unreported and unregulated fishing robbed the rich Pacific island nations of its development opportunities as it reduced revenue from fisheries, undermined investment and employment opportunities that threatened the sustainability of fish stocks. Through the academic courses offered by USP's Marine Studies programme, practitioners were able to collectively contribute to new measures aimed at combating illegal, unreported and unregulated fishing, the minister said, adding that this was evident in the region's collaborative participation in the management of tuna resources under the Western and Central Pacific Fisheries Commission. He said that through community-based programmes in addressing the need to replenish coastal resources, there was a growing number of marine protected areas and conservation initiatives implemented in Fiji and within the region. USP's School of Marine Studies Mission is to assist Pacific Islanders to understand, conserve, develop, manage and utilise their living and non-living resources in a rapidly changing world. The Fijian government in 2017 made a commitment to gazette two large Marine Managed Areas (MMAs) within Fiji's Vatu-i-Ra Seascape, a highly diverse and productive area vital to both people and wildlife alike. The ministry announced that Fiji is committed to scaling up the Bligh Waters and Central Viti MMAs, spanning an area of 13,650 square kilometers. The move protects a host of wildlife species including migratory humpback whales that migrate from Antarctica to the area to breed, colourful vibrant corals, sharks, rays, more than 200 fish species and regionally significant seabird populations. Fiji and the Pacific were highly dependent on coastal fisheries resources. In Fiji, which has a population of over 880,000, more than half of its population depend on the ocean and fish as a source of income and livelihood. The fishing industry exports up to FJD$400 million(US$199.7 million) worth of fish products annually which contributes about 2.9 percent to Fiji's Gross Domestic Product.